As I’m writing this it is less than 9 weeks until Christmas, how did that happen? We are very pleased to be able to support this year’s Christmas festivities with funding approved for MADCAPs who are organising the Christmas Parade and as sponsorship for Christmas Magic in Martinborough organised by Fiona Couchman. The parade will kick off from Dublin Street at 5.30pm on Saturday 8th December, followed by a raft of entertainment in the Square including kids’ entertainment, business house carol competition and the MADCAPs Christmas singalong. Thank you to Fiona and MADCAPs for organising this fantastic community event. Unfortunately we weren’t able to find a community group in time to run our traditional bonfire night and fireworks this year. A real shame, but we do now have volunteers to organise next year’s event. We’ve had a range of feedback about parking in Martinborough recently, we would like to hear your views, please keep an eye out for our parking survey on our facebook page: www.facebook.com/MartinboroughCommunityBoard/. The upgrade of the Cenotaph continues with damage to the newly concreted plinth being assessed for repair. Council have allocated budget, in their 2019/20 financial year, to provide circular seating in the centre of the Square in line with the Square Development Plan. This will be a lovely place for quiet reflection once complete. The wider Square is known as Soldiers Memorial Park and will be recognised as a Place of Remembrance by the New Zealand Poppy Places Trust. Thank you to Maree Roy for her hard work on this project. Finally, the Community Board were lucky to have a sneak preview of the nearly completed Waihinga Centre this week. We were impressed with the new Centre and really pleased to see how well the Hall and Supper Room are looking. This has been a mammoth project and it is a credit to all involved. Whether you are an avid supporter of the project, ambivalent or dead against we’re looking forward to seeing all members of our community making the most of this space. Any suggestions or comments please feel free to e-mail Martinboroughlisa@cornelissen.co.nz. 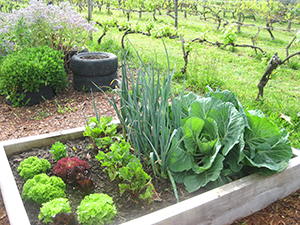 Spring is indeed a wonderful time in the garden, and the Community Garden is no exception. Our spring planting is well underway, and we seem to have chased away the winter blights and vermin. We have planted a large, staggered potato patch, so hope to provide a long season of potatoes. Strawberries are in flower and full of promise. We are harvesting cabbage and silver beet and some very colourful chard, and have delivered a good crop of parsnips to the Larder. Lettuce, beetroot, spinach, zucchini, cavelo nero, beans and various brassicas have been planted. They have mostly survived the “great frost’: just a few sad beans which will be replaced as we now have a seed bank, to cover these events. Our berries are all looking healthy, under cover of nets: next week they will be joined by tomato plants. Medici Café has donated all their coffee grinds for our compost, which is great. Thanks Medici. We have rather more than we can currently use so we suggest that if you would like to help yourself to some of our ‘stock’, feel free to bring along a container and take some from the black bin at the far end of the garden…there is a container there for a koha, which would be appreciated: this will be used to purchase ongoing plant stock. What are coffee grinds good for? They provide a good fertiliser for acid loving plants: enrich your compost: deter cats and dogs from roaming garden beds ; repel pests – sprinkle used coffee grounds around your plants to protect them against destructive pests like ants, snails, and slugs. As we are now into the growing season we are desperate for additional assistance in the garden. From the first week in November we will be increasing our gardening session to include a Sunday session, from 10am -12noon.We welcome new gardeners at all ages and stages of expertise, please join us on either( or both) Wednesday and Sunday. We would particularly welcome a ‘potato monitor’ and a ‘berry monitor’; anyone who has a spare 20/30 minutes a week to be rostered onto watering duties and of course anyone who just wishes to share in the joy of gardening. We have been listed as a “small garden of interest” in this year’s Puhaka Mount Bruce Garden festival, which is a great affirmation, so any assistance to make the garden look stunning would be much appreciated. We would also appreciate any spare mulch that people may have access to, obviously pea straw is out of the question, but once the heat really hits it is essential to keep the soil cool and hopefully moist. Organic mulch will also help improve the soil’s fertility, as they decompose, thus keeping our vegies productive. An easy meal in around thirty minutes. 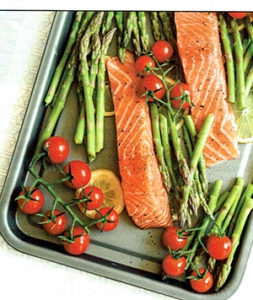 Lay salmon steaks in the centre of large baking dish with the asparagus, lemon slices and tomatoes. Brush the salmon and vegetables with this mix and season. Bake fro 15 – 20 minutes or until the fish is cooked through and asparagus tender. Blitz in food processor until smooth. Serve with mixed greens salad. I was delighted to be able to represent The Mayor and SWDC at the recent Tora Volunteer Rural Fire Force celebrations. Three of the original members, Hamish Sims, Alistair Boyne and Mike Doyle received their 25 year Gold Star awards and it was also the 25 year Jubilee of the Tora Fire Force as well. On behalf of the whole south Wairarapa community I presented certificates to each of the 3 recipients. it was a great evening held at Brackenridge. The Fire Party formed in 1993 with 5 members, Mike Doyle, Alistair Boyne, Hamish Sims, Warren Barnes and Ian Pickering. The first thing was to come up with a name and the Tora Fire Force was formed. John Welford of SWDC secured their first fire engine, a long wheel base landrover, with a high volume pump on the front, a siren and flashing beacon. No hoses, etc but at least they had a vehicle!! In the years since, along with the district, Martinborough Lions, South Wairarapa Rotary, National Rural Fire Authority and a huge amount of fundraising, the Fire Force is now well equipped to service the district. We congratulate the recipients, and also past & present members of Tora Rural Fire Force who have given up so much personal time to protect their community and the surrounding area, Thank you. Councillors, Community Board members, Maori Standing committee members and Council staff, recently attended Treaty of Waitangi training at Hau Ariki Marae. This was taken by Dr Ingrid Huygens, National co-ordinator, Tangata Tiriti – Treaty People Project. With the Wairarapa treaty settlement negotiatons going on at the present time, this was a real opportunity to learn, from a different prospective to those taught in our school days, about both Maori and Pakeha history. In some aspects a real eye opener for all of us. Ingrid, we thank you very much for our new understanding. I recently had the opportunity, along with other councillors, to go through the Waihinga Centre. Although this is not quite finished, it is truly amazing inside and out, one can now visualise where everything is going to go and to see both the supper room and the main hall on the same level, is fantastic and I am sure that is what everyone wanted. I am looking forward to hearing everyone’s positive comments when they have the opportunity to see this for themselves. Congratulations must go to the Trust members for all the time and effort they have put into this and to Council staff who have kept the finances on track and within budget. Best wishes to everyone for a very happy November and the count down to Christmas.